Allentown's budget drama is officially over after a wild weekend of politics, and residents are now dealing with a historic property tax increase. Mittman: >>>jaciel cordoba: allentown residents are dealing with a historic property tax increase..
After a midnight deadline saturday..
>>>eve russo: mayor ray o'connell made a las?second veto of council's proposed amendment to his budget.. Which made his 2?percent tax increase law. Wfmz's alexandra hogan is joining us now live with more. 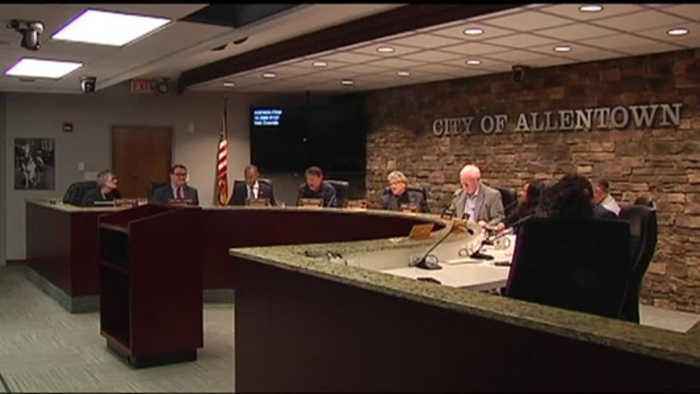 >>alexandra hogan: eve, jaciel, city council and the mayor agreed that the city should have raised taxes incrementally over the years but since that didn't happen... it led to a very dramatic night up to the final seconds of the allentown budget deadline. >>>reporter for the first time in 13 years, allentown residents will see a property tax increase. Forth, and a midnight veto.. The new law raises the rate 27 percent. >> mayor ray o'connell, allentown "i feel, in my heart and in my head, what i did was financially responsible for the citizens and allentown and for the residents. >>reporter last week council proposed a reduction of mayor ray o'connell's tax increase.. But saturday night, the mayor ran out the clock to prevent another city council override vote. Nats mayor o'connell vetoes bill 77 "i veto bill 77." >>>reporter he waited until 30 seconds before midnight saturday to han?in his veto. >> candida affa, allentown city council "financially, we need the money. We truly do and my argument has always been we cannot cut services" >>reporter some council members pointed out resident feedback that some people in allentown won't be able to afford the new charge >> julio guridy, allentown city council "i'm not saying we don't need to raise taxes. Of course, we probably need to raise taxes a little bit, real estate taxes, but it doesn't have to be 27 percent in one shot." >>reporter the mayor and city council did agree though that the budget process needs an overhaul to prevent this kind of scenario again "start the >>alexandra hogan: the mayor went on to say that he and council have already agreed to try to do that by sitting down and beginning in january or february.